« Who Should Obama Nominate? I listened to many of my techie / developer friends last week lament the “evils” of Apple’s restrictive policy involving what apps can exist on the iPad and iPhone. 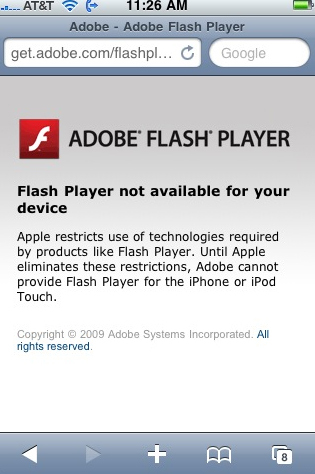 Apple has blocked Adobe’s Flash, and removed Scratch from the iTunes store. Both technologies allow users to create and run their own applications without having to go through the iTunes store and Apple approval. Scratch is specifically targeted towards getting kids to program. The move has really annoyed a lot of developers on both ideological and practical grounds: They’d prefer a more open platform, and they’d prefer not to have to pay Apple fees for the right to develop apps. Many presume that’s what this is about: forcing developers to go through the iTunes store, controlling content, and turning a small profit on developer fees. If only Apple’s goals were so benign. I suspect there’s actually a lot more to Apple’s desire for control in this area, and that to some extent we’re seeing a repeat of the browser wars of the 1990’s (and possibly a similar antitrust lawsuit as the one against Microsoft). For those unfamiliar with the Microsoft antitrust case, basically, Microsoft saw the potential web browsers had for weakening the role of the Windows Operating System. Bill Gates and Co. realized that in the future, more and more computer use would be accomplished via the web-browser and that as such there’d be less need for computer-born applications, and that web-browser-based applications were not tied to Windows, and thus easily portable to other operating systems. So in order to maintain it’s Windows monopoly, Microsoft tried to monopolize the web-browser market by bundling and promoting Internet Explorer. Needless to say, it didn’t work out so well and Microsoft lost in court. The case today with Apple is a little different, but the end goal is largely the same. Depending on how you define the relevant market, you could argue that Apple doesn’t have the sort of Monopoly power that Microsoft had (it definately doesn’t have a monopoly on cell phones generally, but it likely has a dominant market-steering role in the smart-phone market… every developer wants to deploy on the iPhone first. Apple is also arguably going much further than Microsoft tried. Whereas Microsoft tried to make IE the dominant browser… Apple is simple forcing everyone to use their underlying program architecture (it would be like Microsoft blocking all other browsers and only allowing Microsoft-approved software on their systems). The outcry would have been ridiculous had Microsoft tried such a thing. There have been rumors flying around that Adobe might sue Apple over it’s new policy. While it’s uncertain what legal logic Adobe might use, I think there’s a strong argument that Apple might be trying to illegally monopolize the smart-phone market. While it might not have a “monopoly” yet, the iPhone is likely the dominant platform that people make applications for. There’s a reason practically every new mobile app debuts on Apple first: it has the largest app store and a huge user base. Flash and Scratch offer the potential for creating apps that are easily portable from one platform to another (just like the web-browser back in the day). The more Apple can block easy-portability, the more it’s app store grows relative to the others, and then it ends up being only a matter of time before it has a true monopoly. That said, there’s a decent chance this might not work. Open platforms such as Google’s Android are quickly gaining traction (and the rise of Mozilla Firefox during the browser wars made the war itself moot). While Apple’s goal might be to slow the adoption of programs onto the Android or Windows platforms, it might not happen given today’s pretty quick development cycles. But then if that’s the case, Apple’s making a poor business decision, which it rarely does… so i think there’s legitimate reason to worry. 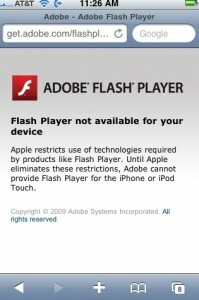 This entry was posted on Monday, April 19th, 2010 at 10:03 am	and is filed under Antitrust, Technology. You can follow any responses to this entry through the RSS 2.0 feed. You can leave a response, or trackback from your own site.